The Importance of micro-chipping your cat! 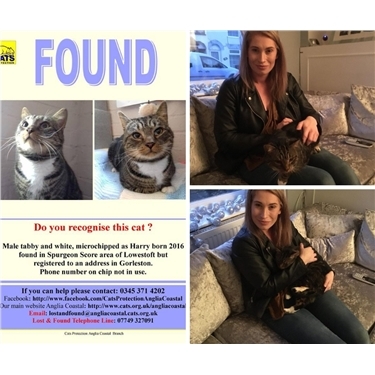 George (finder gave him the name) came in to our care after he had be reported straying in the Spurgeon Score area of Lowestoft, George was routinely scanned for a microchip and it was found that George is actually a Harry! Branch Coordinator, Christine Cutts was joyous with the reunion and cannot stress enough the importance of getting your be-loved cat chipped. Our branch regularly hold “Snip & Chip” events the first Thursday of every month at the over 60’s club in Clapham Rd, Lowestoft. For just £10 for people on means tested benefits. For further information please contact Linda our neutering volunteer on 01502 679101.